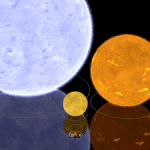 This post was originally published on May 25, 2008. It was substantially revised and re-posted on September 28, 2015. If Khalessi and Anakin can be baby names, why not this lovely choice from science fiction? 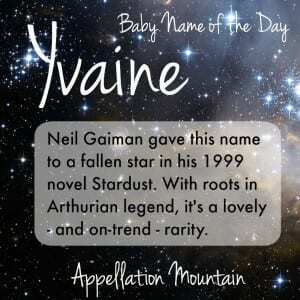 Thanks to Natalie for suggesting Yvaine as our Baby Name of the Day. 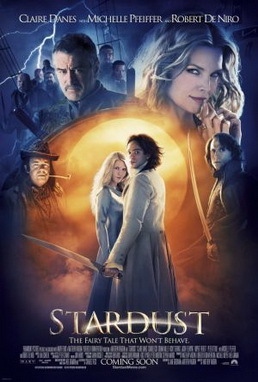 Neil Gaiman invented Yvaine for the heroine of his 1999 novel, Stardust. It became a movie in 2007, with Claire Danes as the star. Her love interest answered to a more traditional fairytale hero name: Tristan. Though that’s only in the movie. In the novel, Gaiman called him Tristran. 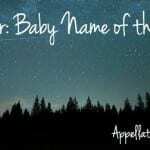 There is no etymological link between the name and the words evening or star – though certainly the “yv” sounds like “eve.” But Gaiman did not pluck his name out of the night sky. It could be an early version of the name Eugene. Others claim it’s related to the Celtic god Esos. Origins aside, that famed spinner of fable Chrétien de Troyes penned Yvain, le Chevalier au Lion back in the 12th century. His knight does battle with some bad guys, wins the loyalty of a pet lion and gets the girl. So Yvaine stands up well as a feminine form of a hero name, and her own adventures in Stardust wrap up with a satisfactorily happy ending. Before the movie hit the big screen, no one was using Yvaine as a given name. But in 2008, there were eight newborn girls given the name. Even as the movie has faded, the name has remained in sparing use, with fourteen Yvaines born in 2014. Some of that might be thanks to the movie’s cult classic status. But it also speaks to Yvaine’s on-trend sound. Hidden ‘ev’ sound names like Genevieve, Maeve, and Evangeline. Respellings and inventions like Evolet have fared well, too. Alternate spelling Evaine hasn’t gained traction, though with Elaine on the rise, it does seem like a possibility. 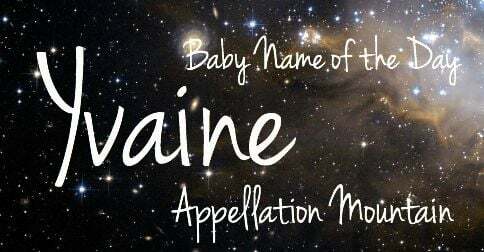 Yvaine might not have much history as a given name, but with ties to Arthurian legend, this name doesn’t feel like a complete novelty. It shortens nicely to Evie – or is that Yvie? Another Gaiman semi-invention has raced up the charts in recent years: Coraline, which the author discovered when he swapped two vowels in Caroline. 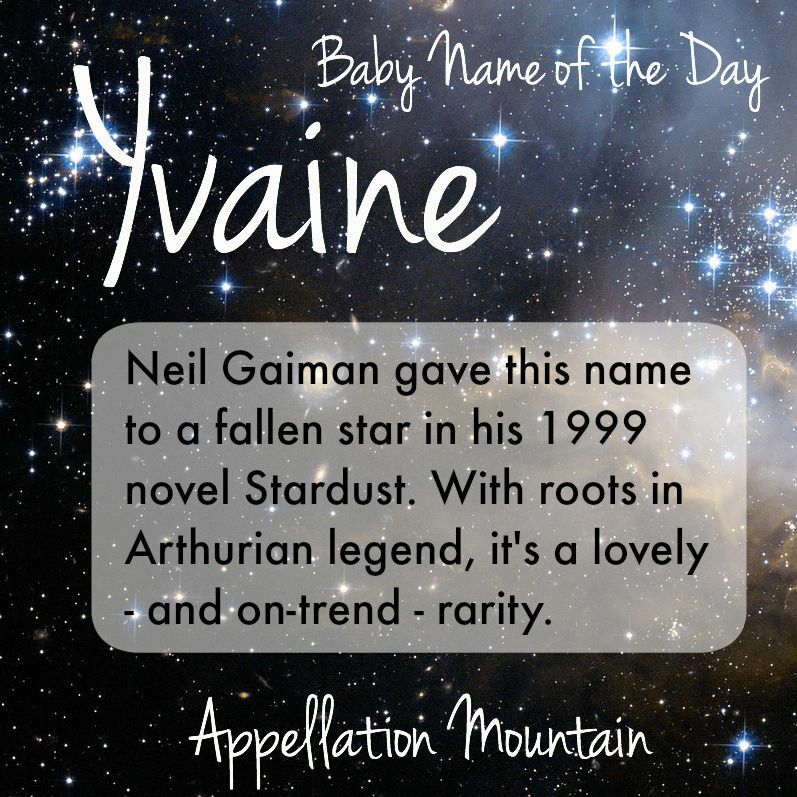 While Yvaine doesn’t seem likely to be as popular, Gaiman definitely qualifies as a talented namer. If you’re after an unexpected name and a sophisticated sound, Yvaine is promising. It would also be a gorgeous middle name, and a great substitute for the conventional Marie and Nicole. What do you of Yvaine? Is it wearable in 2015? We named our daughter Yvaine Rhiannon (evening star / goddess of moon) . We saw stardust when I was pregnant and it was the first time I felt her move! Couldn’t really name her anything else!!! The spelling Tristran has always aggravated me, being a mishmash of the French Tristan and the English Tristram. Every time I read the book, it bothers me. Ah, the perils of being a research onomast…. Reminds me of Ygraine, a name I’d love to use but don’t have the guts for. I think with “v” sounds being so trendy, Yvaine’s a bit more wearable. My middle name is Elaine, and Ygraine/Yvaine share that sort of Arthurian vibe. I also thought of Etain, and through Ygraine it seems sort of connected to Grainne. All in all I really like this one, thanks! I had a manager whose name is Yvonne and everyone calls her Yvo. Which I think is a super cute nickname. My little girl is named Yvaine and we call her Yvie for short. My hubby and I wanted out children’s names to be uncommon but not overly odd. Yvaine fit perfectly. We also chose it bc I love the book and the movie. I really like this name, and a friend of mine pointed out the VAIN part. I still like it, though. I was also thought the name seemed medieval and wasn’t surprised by the link to Authurian legend either. The names that came to mind were Ygraine and Gawain. LOL at your image of Yvette! And yes, the youngest Yvonne I know is in her 40s. Neither is a promising baby name these days. I thought about Gawain when I was writing this, but I wasn’t familiar with Etain. (My knowledge of Irish mythology is weak.) Etain is a truly lovely name – and an intriguing story, too. All those years as a butterfly! I think it’s pretty! For those familiar with Yvonne and Yvette, the pronunciation is rather intuitive. However, while Yvonne sounds like an old woman and Yvette brings to mind an ’80’s teenager with ratted hair, Yvaine sounds fresh and intriguing. The name does strike me as very medieval; I wasn’t surprised by the link to Arthurian legend. It reminds me a bit of the names Etain (of Irish mythology) and Gawain (another Arthurian knight, and the original form of the now-popular name Gavin). D’oh! I should’ve included a pronunciation. Think Yvonne, but with a “vain” at the end instead of a “vonne” – ee VAIN. And Yves sounds like EEV. Actually, the fact that the second syllable of the name is a negative – vanity, vanity! – is a real downside to the name. And you’re right – it’s not the easiest pronunciation to puzzle out. At the risk of sounding dumb, I have no idea how to say this out loud. ee-VAIN? EH-van? EH-vain? I like the reasoning behind it, but I’m just not hip on the French and Ys at the beginning of names. I also don’t know how to say Yves, either. French Yves identical to English Eve.